I have created a number of software programs, a couple of ebooks, (some showing back exercises, and others aimed at video makers), a publication called "Lifebook" that's available on US CreateSpace / physical copy in UK, and a few other items that are a "work in progress". Some are listed on this page. Don't forget to take a look at my blog too! This software has the tag line "The Swiss Army Knife Of Software". on virtually any site that doesn't use frame breaker code. and your links remain at the top of he page whilst the affiliate offer loads in frame below. you can allow them to select their own gift from a range of products you promote. 1) A few years ago, the FTC made a ruling that all websites should display "Policies" to the user. These would tell users more about the website, any disclaimers, user privacy, minors using the site and so on. These had to display when the user clicked a visible link, and only close again when the user decided to close the window/page. This software makes the entire process simple to use. A single admin screen allows you to edit the policy, then click a button to see what the end user will see. You then add a few lines of code to your web page, and the software displays drop down menus / contact button anywhere on screen. And they remain visible at all times, even when the page is scrolled. 2) The ticker is a little script sits at the bottom of the page - where it remains even if the page is scrolled. Unlike other "tickers" that scroll text across the screen, this unit displays a single advert line for a few seconds before display the next advert in the sequence. As well as simple text ads - which can also include a small product graphic if you want - the ticker will also allow people to email you directly from the ticker itself. Plus, it also allows people to subscribe to your mailing list, again, directly from the ticker itself. You can set up as many tickers as you like, perhaps one for each site you operate ... or even one on every page. Everything is controlled from a simple to use admin screen. Now some websites offer a simple link that users can easily miss. However, this software goes one better. Once they click the "ACCEPT" button, the site unlocks again and allows them to proceed as normal. There is a type of bet that some people like to use called an "accumulator", (also known in the UK as a Yankee or a Canadian) The idea is you place a bet on four or five horses, and some of the winnings from each horse is placed on the next runner. This can give multiple winning bets ... and a large payout! However, if one or two horses fail, the returns drop drastically! Plus you need to list your four or five horses before you give your betting slip to the bookie. This software takes the concept one stage further. It allows you to back one horse a day / week, when you strongly fancy that particular runner. It then tells you how much money to put on the next runner. This is a FREE banner Exchange network with a couple of unique twists. When people click on a banner, instead of being taken to the site directly, they're given the chance to subscribe to your mailing list. Whether they subscribe or not, they are then taken to the site in question. Also, the network operates on a 1:1 exchange rate. In other words, if you display a banner on your site, your banner will be shown on another site around the network. With the free version, you can place a simple search box on your site. Users enter a keyword, and it searched the ClickBank database for suitable products. If the person visits that vendor and purchase, YOU earn the commission. They purchase a product from a "mini site"
They purchase an item listed in "The Directory"
And the paid version offers even more. Too much in fact to detail here. When my Aunt moved into a residential home for dementia patients, I was asked to enter details into a book saying what sort of life she'd led. Whilst I could answer a few questions, some remained a mystery. (For example, I knew her husband's NAME, but no idea where she met him!) So it set me thinking. 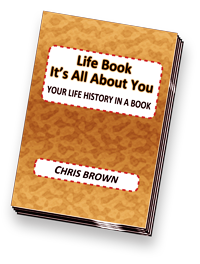 There must be other relatives in a similar position ... so why not have a book where people are able to write down their life in a book whilst their memories were still intact. And so it was "Lifebook" came into being. The basic idea is it can act as a prompt. Relatives can consult the guide, and ask their relation relevant questions to invoke their memories. Plus, the book can become a 'hand me down' so that future generations can discover what sort of life their Great, Great Aunt lived ... and all written in the person's own hand! This is a personalised letter from Santa. The parent simply fills in a few details, selects a background and clicks a button to order. Not only do they get the letter, they also get a "Nice List" Certificate, a colourful envelope AND a signed photo from the Big Man himself. This service comes in two 'flavours'. One option is where the PDF files are downloaded by the parent, and printed off from their home PC. The other is where they are printed and mailed by the seller. The latter option allows the seller to print on higher quality paper, print the Certificate on card, and add a gold seal ... and perhaps even encapsulating the Certificate so it remains a keepsake. What's more, since everything is run by computer servers, there is an option for agents to promote the service to their customers, and keep 100% of every sale they make!